How Much Scale Is Needed in Enterprise 2.0 Employee Adoption? A couple recent items caught my eye with regard to the issue of employee adoption of social software. In Reversing the Enterprise 2.0 Pricing Model, Julien le Nestour argues that pricing per user for social software should increase as more employees use it, because the network effects of higher participation make the software more valuable. It’s a great theoretical piece, tying pricing to value received. But in the harsh budgeting realities of the enterprise and in the comparison against other software pricing models, it’s not likely we’ll see anything like this. Atlassian, maker of the Confluence wiki and developers tools, recently passed the cumulative revenue mark of $100 million. In the post announcing this milestone, Atlassian blogger notes that the company has no sales force. People just download the app. I know some of the Atlassian guys, and this kind of viral, bottom-up adoption is core to their philosophy. They don’t sell to upper management, adoption occurs at the departmental level. That being said, I am aware from my work at Connectbeam of some large-scale rollouts of the Confluence wiki by Fortune 500 companies. What connects these two items? The first post describes the nature of Enterprise 2.0 apps and how their value increases as more employees use them. The second post points to the value that departments have received from Atlassian’s Confluence wiki, even without broad adoption. In other words, network effects are not a critical aspect of the Confluence value proposition. You don’t need a high level of adoption to get value from some Enterprise 2.0 apps. Others require broad participation. In some ways, that may seem obvious. Yet I don’t tend to hear this distinction being made. Usually, all social software is lumped together under ‘Enterprise 2.0’ and there is a collective view that wide-scale adoption by employees is a necessity. It’s actually more nuanced than that. This graph has a couple of implications for Enterprise 2.0 vendors. Before that, here’s an explanation for why I put the different applications where I did. Before discussing these applications, I want to note this. All social software applications get better with higher adoption. There is no disputing that. The distinction I want to make is that some apps require increased participation before they deliver value. Blogs: The nature of a blog is a single person’s thoughts, observations and ideas. Inside companies, these applications can be tools for the ongoing recording of things that fall outside the deadlines and process-oriented activities that make up the day. Making them public is a great way to share these contributions with other employees and establish your record of what’s happening. If only a few key people blogged inside a company, there will be value in that. Wikis: Wikis actually have two purposes: (1) knowledge repositories, and (2) projects and collaboration. It’s that second purpose that makes wikis particularly valuable even with small participation. I’ll use Confluence as an example. We use it as our low home for putting up documents accessible to anyone else, and for free-form contributions on all manner of things. It is very much a utilitarian use case for us. If we weren’t using Confluence for this purpose, we’d share documents via email. In larger organizations, Confluence may replace usage of SharePoint or the company portal. Using wikis as knowledge repositories, such as [Company Name]-ipedia type of implementations, requires a larger percentage involvement. Sparsely populated company versions of Wikipedia are of little use. As are wikis that are not updated regularly with new information. I’d put wikis-as-knowledge-repositories up there around prediction markets in terms of required participation. Forums: The old man of Enterprise 2.0…forums. These are the place where topics can be posted, and a scrum of conversation occurs. To really get value out of these, it helps to have larger participation. Blogs are solo voices with interesting content. Wikis can have a very specific collaboration purpose among a few employees. Conversations around a topic require a wider variety of voices. Otherwise they fail to give people a sense of what others are thinking. Nothing sadder than forum post with no comments. Social bookmarking: Bookmarking sites you find useful has value by itself. So in that sense, “social” bookmarking can work for very few employees. But it’s not really “social”, it’s simply a replacement for your browser bookmarks. You get value by finding those gems your colleagues deem interesting. The odds that any single bookmark will be useful to you are small, so you need a healthy amount of bookmarks to increase the chances of finding links that will help you. And to get a healthy amount of bookmarks, you need broader participation. Microblogging: In some ways, microblogging could be compared to forums. Both are public places to serve up topics. But they’re fundamentally different. And that’s why broader participation is more important here. Forums have a distinct purpose – the discussion of a particular topic. You need participation by those who know something around the topic. Microblogging is a more free-form, personal activity. You don’t need a distinct purpose to post something. You post all the things that occur to you during the day. Some of which will have value, although it can be hard to predict for whom. It also helps to know that people are seeing these posts, because there is a conversational aspect to microblogging. The free-form, who-knows-what-might-be-interesting, conversational aspect of microblogging require larger participation than forums do. Prediction markets: Prediction markets thrive on having a variety of ideas, events and initiatives. They also require the different perspectives of employees, leveraging different perspectives, knowledge and experiences. This is true wisdom of crowds work. Limited participation limits the value of prediction markets. These benefit from broad employee involvement. Social networks: I put these at the top of the chart in terms of employee involvement. Perhaps one of the best use cases for social networks is finding colleagues with the knowledge or interest in projects you’re working on. This requires large-scale participation. If a social network only is used at the departmental level, it doesn’t provide value. In terms of expertise location, you’re probably already aware of what others in your deparmtent know. It’s breaking out of that traditional sphere of contacts where social networks shine. I know I’ve heard many instances of large corporations suffering from “reinventing the wheel” syndrome because employees lack visibility about what others know. Broad participation addresses this issue. Three implications of this view about required involvement come to mind. Greater required participation correlates to greater impact on a company’s value: Generally, you could change the metric in the chart above from percentage of employee involvement to impact on company value. The increased participation means the associated application will also have a larger effect on the company’s strategies and operations. It’s not an tight correlation, but a general trendline. Exceptions will abound. Top-down vs. bottom-up: General observation is that broader participation requires a greater amount of senior management support. That’s the way things work inside companies. Employees will listen when the executives of the company push something. For applications that need lower participation, the name of the game is to provide a compelling application with a low entry cost. Departmental budgets and the green-light from employees at lower levels of the organization are all that are needed. Time for application to gain traction: With applications that require low levels of participation, there is plenty of time for the application to grow virally. It serves its purpose for a select few, and over time others will see the value and elect to participate. These apps can be resident inside companies for long periods of time. Those that require higher participation to see value will need to show results sooner. They are on senior management’s radar, generally cost more and have a greater number of employees who will be watching to see the results. So it matters what type of application we’re talking about when it comes to Enterprise 2.0. It matters for companies and vendors. It impacts the skills required for everyone’s success. A nice post that complements this one is Adina Levin’s Scale effects in enterprise social software. 16 Responses to How Much Scale Is Needed in Enterprise 2.0 Employee Adoption? Great points and breakdowns on the various applications. It’s interesting to look at the adoption velocity within the organization that an app needs to have before “new” value is actually obtained. Social Networks need to expand beyond known contacts and break the traditional enterprise thinking with new and challenging insights from others. Greater widespread participation and governance is key. Thanks Tom. Enterprise 2.0 is a useful term for a class of services, and more importantly the culture required to use them effectively. But it is important to note the different use cases and value propositions of the individual applications under the Enterprise 2.0 umbrella. Can’t treat them all the same. while I do absolutely agree on your point that different tools requires a different level of adoption and effort on the organization side, I’m not completely sure you can exactly compare any couple of tools through this criterion. Time ago I published this Enterprise 2.0 Framework (http://www.socialenterprise.it/index.php/2008/10/31/enterprise-20-framework/ english at the bottom) taking the inspiration by Andrew McAfee’s bullseye and positioning the tools on 3 axes: type of activity, interaction strength and scope. – Tools can be positioned in circles: It’s not really easy to exactly tell if blogs need a stronger participation than social bookmarking because their use is deeply different and you could get value out of it with 50 users as Bupa did with Cogenz, but you can use the strength of interaction and scope to create clusters. The positioning of tools in my diagram is slightly different to your one. Probably that’s because the percentage of employees involved cannot exactly be mapped to the two dimensions I’ve used. Nonetheless tools like blogs can be used in very diversified ways: for example to handle distributed project management like originally discussed by Rod Boothby in his activity centric blogging. To this goal, the level of participation should be much higher though. The same can be said for microsharing where you can discover a lot of information even in a group of 50 people that work in different offices or chasing customers outside from the office. 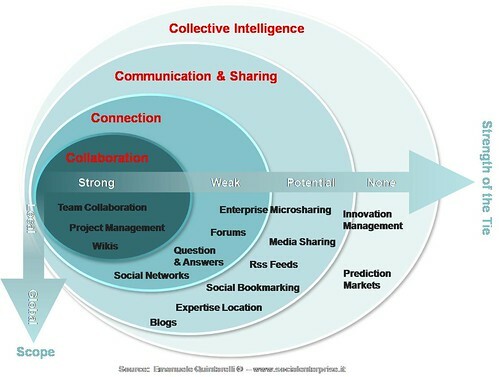 The categorizations are a really useful way to think about different modes of emergent contributions: collaboration, connection, communication & sharing, collective intelligence. I’ll have to noodle on your diagram a bit, especially for innovation management. Maybe a Spigit blog post on that one. Yes, since almost all people are into social networking today, employees should adopt it more.